This book is a touching personal memoir with profound lessons for some among us. Cheryl became a lost soul when her mother died at an early age and her family disintegrated. Even Cheryl’s loving husband couldn’t save her from self-destructing as she plunged into heroin addiction and sexual escapades to escape from her pain. 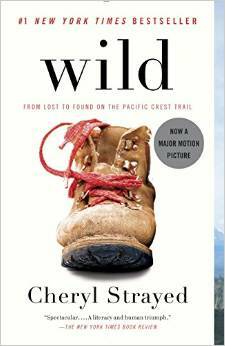 That is when the Pacific Crest Trail (PCT) unexpectedly called her name, and set her on a grueling path to self-knowledge. The PCT is a west coast hiking trail that extends through the deserts, mountains and wilderness from Mexico to Canada, and is rarely undertaken solo. And yet twenty-something Cheryl sets off completely alone, physically unprepared and ill-equipped, and with a minimum of camping/hiking skills in her background. She endures devastating heat, freezing temperatures, rock slides and ice plains, bears and rattlesnakes, water shortages, even a loss of her hiking boots as she numbly tramps 1100 miles along the PCT, ultimately learning to revel in the isolation, the challenges, the sacrifices: a soul-cleansing like no other. We are clued in along the way to Cheryl’s background, her intense relationship with her mother and her mother’s horrific death. We are treated to some fascinating backpacking stories, some scary moments, and lots of emotional unpacking as we trek along with Cheryl, but she does all the heavy lifting—both literally and figuratively—in coming to grips with her own personal fears and overcoming them. Her writing is not particularly lush or poetic, but it matches her circumstances and draws us along. While I occasionally was rooting for her to do a few more PCT bypasses to shorten the story a bit, the end is satisfying and life-affirming. Having read her fabulous series of essays in Dear Sugar, I have to say that the tough love Strayed learned to apply to herself during her PCT trek, has clearly been honed to a fine art since. I highly recommend her “Sugar” columns. Share the post "A Wilderness Trek into Self-Discovery"
64-year-old book lover and mother of an English/lit teacher and a would-be film/tv screenwriter. Need more be said? Courtroom thriller without the usual Lescroart oomph!